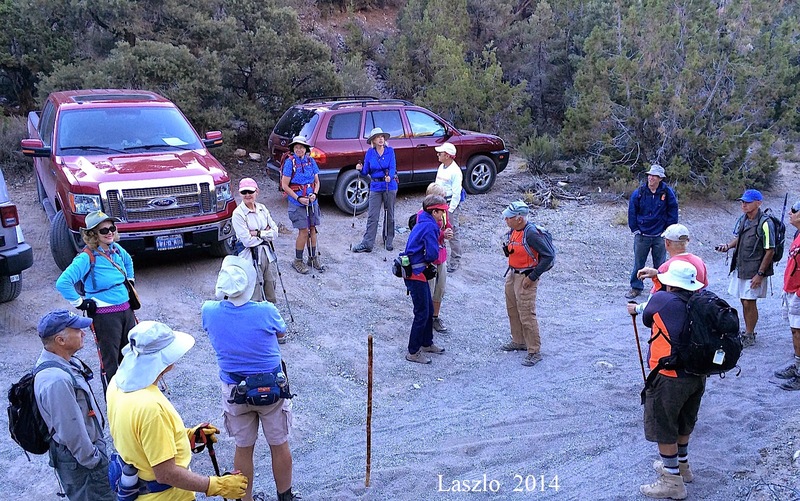 A large group of twenty hikers came out early for a hike to Little Zion (aka The Park). The early hour was called for due to the longish drive to the trailhead. We drove out Highway 160 over the Mountain Springs pass and turned right onto Lovell Canyon Road. At one mile down the road, we turned right into a small, deep gravel road. This is Rainbow Springs Road that heads into the Rainbow Wilderness behind the Red Rock Canyon escarpment. The road is in pretty good shape but, still, high clearance vehicles are recommended. The tight turnaround at the trailhead parking could get you into trouble if you aren't prepared. 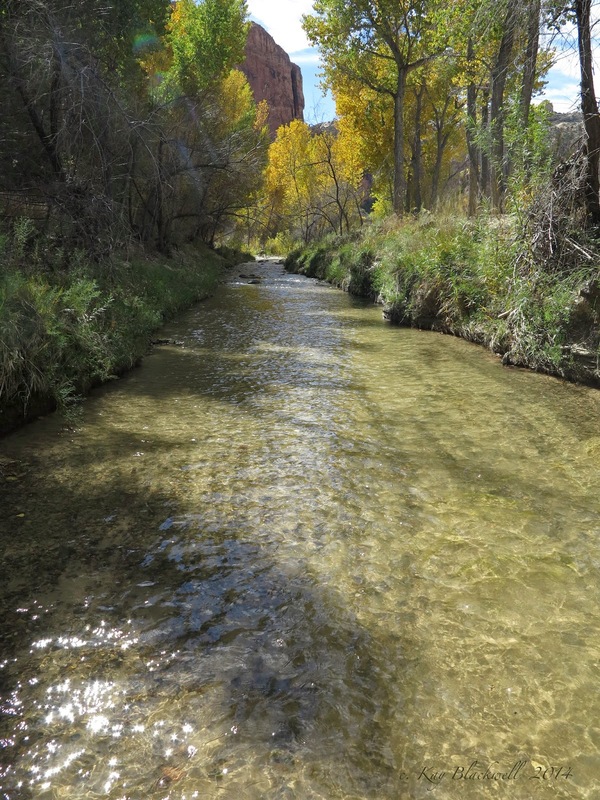 We parked at the springs where the road becomes impassable by large vehicles and began the hike. 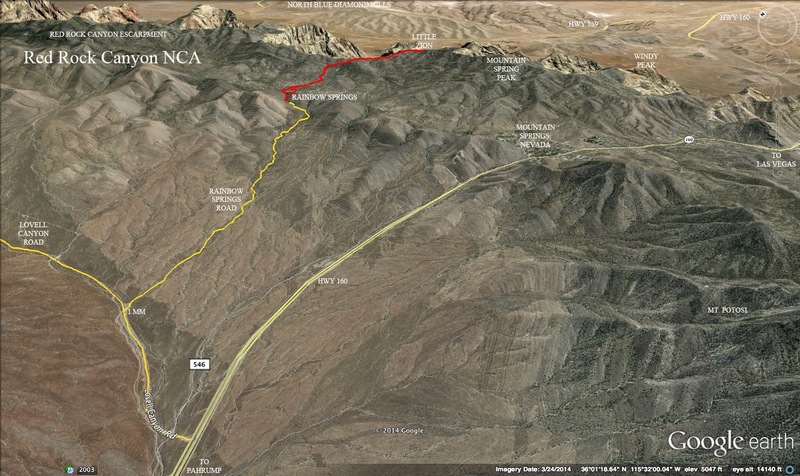 Hoping to find an illusive trail, we hiked up the road to the agave roasting pit. Running into the marshy spring area, we decided to reverse our steps back to the wash below the marsh. We followed the wash up while continuing to choose the right fork of every wash presented. Soon, we came to the wall climb and knew we had chosen correctly. From there, the right hand wash led us up toward the escarpment and curved around to the left. As we neared the top, we came to a blocked and cairned turn into a wash on the right. 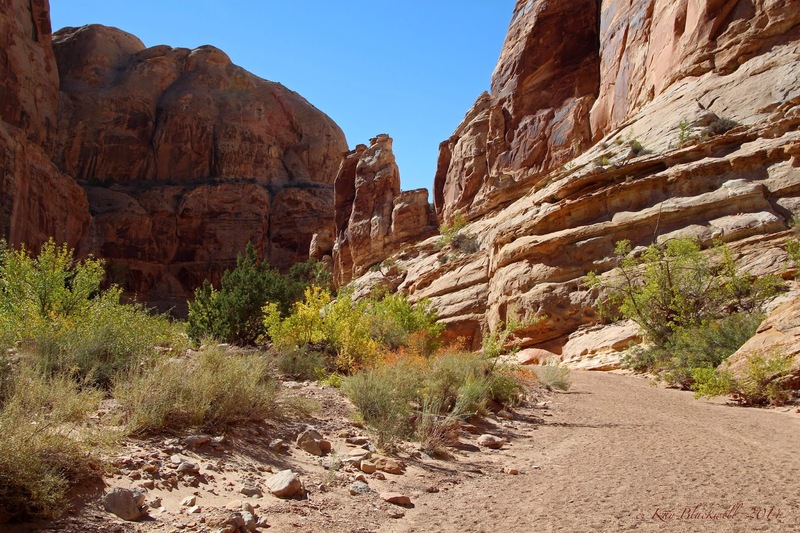 This smaller wash continued up to the rim of the escarpment with a well used trail. And, tah-dah, the overlook of Sandstone Canyon and Spring Mountain Ranch State Park came into view below. A short break ensured us that all twenty hikers were together, then we turned to our right and began following the trail that circumvented the escarpment rim. This trail involved three short but steep ascents. The last ascent brought us to The Large Cairn. Our views of the escarpment and Calico Hills of Red Rock Canyon during the circling of the rim were colorful. It was a cool and beautiful day. Bad weather would be coming in soon. We passed The Large Cairn and took the trail that bears around to the right for our descent to the sandstone. This trail continues until it hits a small wash. We used the wash for the rest of the descent navigating around a dry fall at the end. 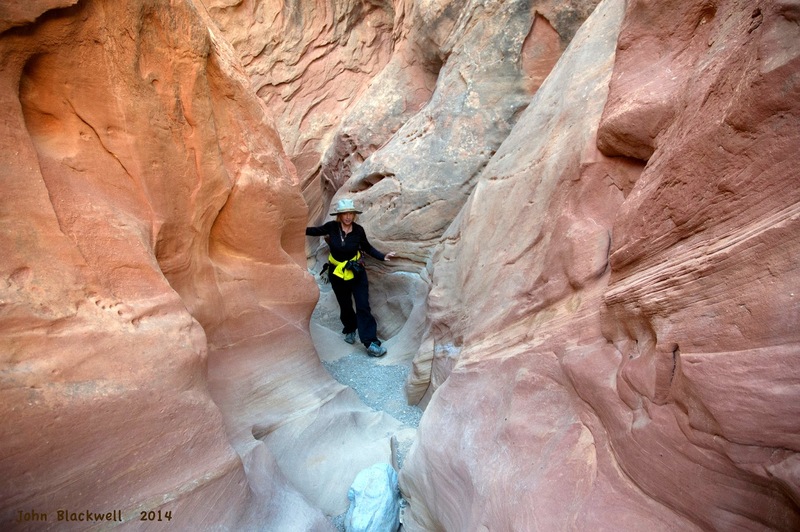 The dry fall might as well be the front door to Little Zion since the next part of the hike was pure sandstone. The first photo of this entry shows the front door entrance. We had just come in the front door when we noticed two bighorn sheep leaving the area going in the direction of the closed arch up to the left. After watching the bighorns climb all the way up to the rim, the big group scattered into three or four smaller groups. 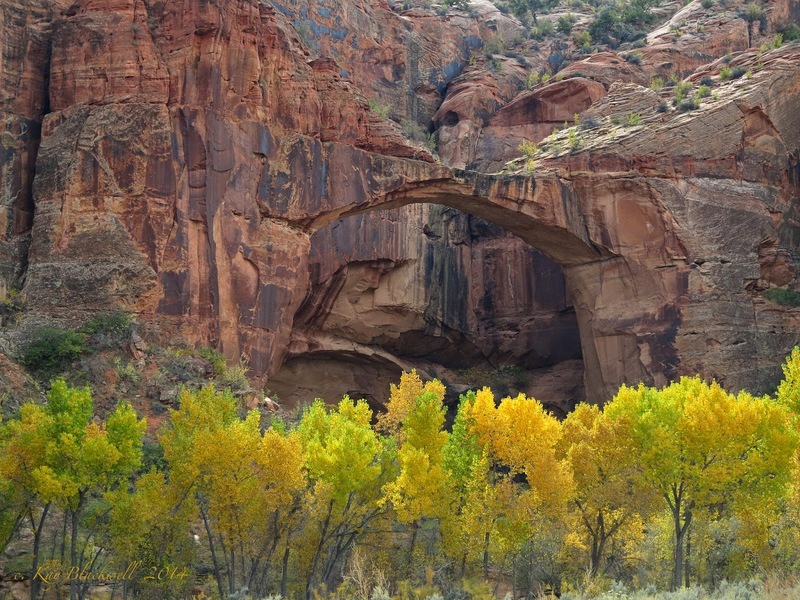 Little Zion is a great place to forget the snack and just go explore. One group sat on the expanse of sandstone and enjoyed a nice view of the Strip. Another group climbed to the top of the arch. Single explorers went in a few other directions. It was a great day to enjoy The Park! For the trip back up to the limestone, we took the shorter but steeper route up the wash at the side door to The Large Cairn. Once we got up to the rim of the escarpment, we simply followed the trail back around to the small wash approach. 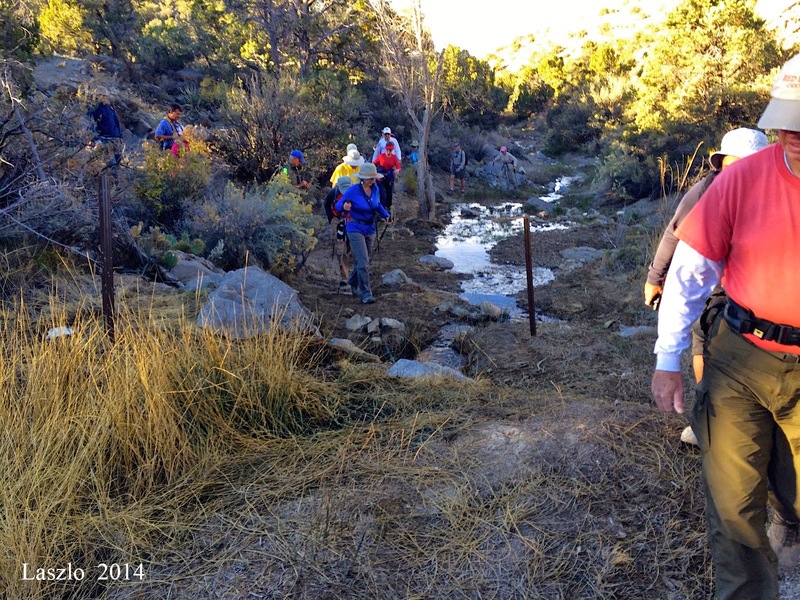 We descended the small wash and larger main wash back to the springs area. Finding the trail that cuts across to the trailhead on the left side of the wash, we took this route back, past the agave roasting pit and down the road. A great hike, a great day! 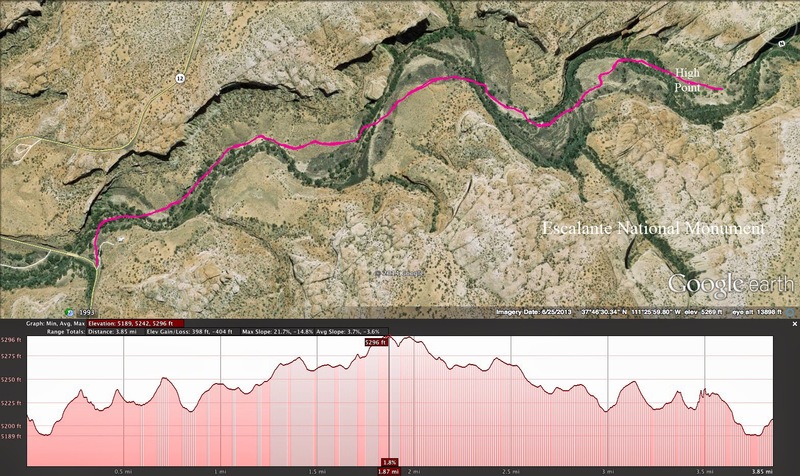 Four club members had just finished lunch at the Kiva Coffee House on the hill above the Escalante River (plug) when three of them decided to do a short afternoon hike to the Escalante River Natural Bridge whose trailhead was just below. The fourth whiled away the two hours in the coffee house with a gorgeous autumn view (plug). We parked at the river trailhead and, as soon as we started down the trail, we were faced with the sign in the photo to the left! Well, we weren't going that far! 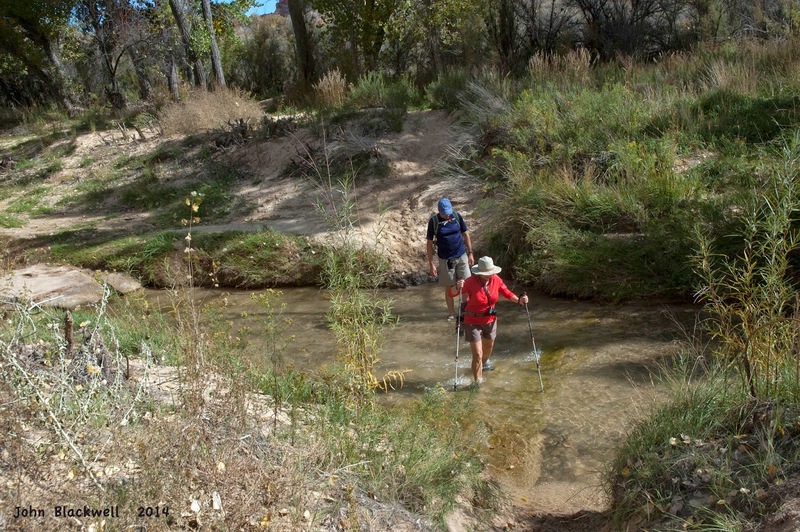 In our short research, it wasn't clear if we were going to have to get our feet wet in the short two miles upstream. But, we immediately had to take the plunge as we headed in the direction of upstream. John and Tim had water shoes but Kay went in with hiking shoes and hiking socks still attached. Note: Tim was very bothered by the sand, stickies and ants while hiking in his water shoes that had little protection. After the first river crossing, there is about a half mile of trail before the second. Most of the trail along the river is deep sand. The hiking is tough on tired legs. 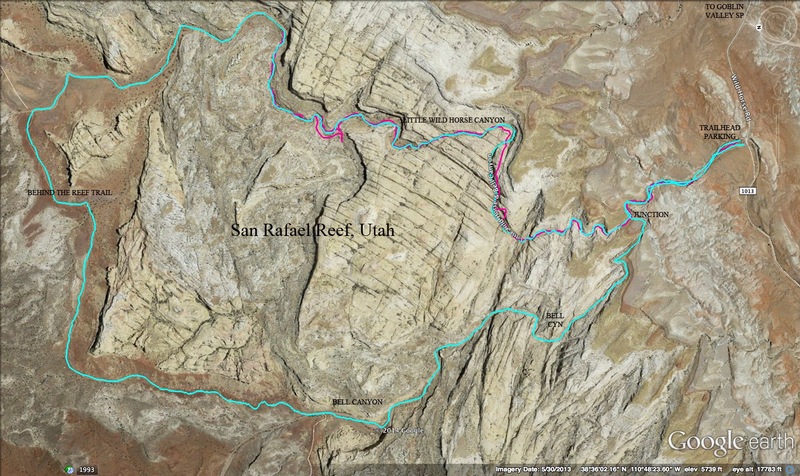 We had done the six miles of Lower Calf Creek Falls earlier that day. But, curiosity about the natural bridge kept us going. We had heard that the bridge was not "all that." We wanted to see for ourselves and ... it was a hike suited for the autumn afternoon. We quickly learned to enjoy the shallow river crossings (5 total one way). It was cool on our tired feet and the views from the middle of the river were colorful. Plus, it washed the sand off of our shoes! About half way up to the bridge, we saw a grouping of tents up on the hill to our right. Soon, we started hearing chainsaws cutting trees. After passing the view of the natural arch located upstream from the natural bridge, we came upon one of the workers in the crew. He explained to us that his crew were taking out non-native Russian Olive trees from the river area. Geez! That's a job! 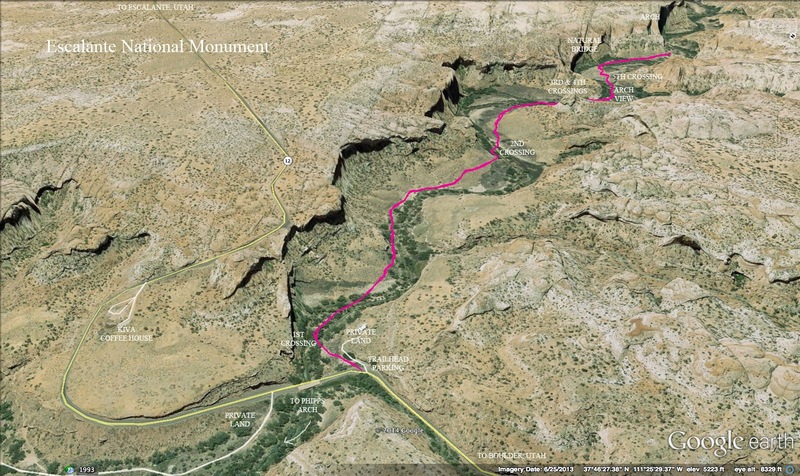 It was in this vicinity that we found the natural bridge located on the left side of the trail in an alcove. It was actually more impressive than I had been prepared for. Very large and distinctive. It was especially photogenic with the yellow cottonwoods in front of it. We went a little further up the trail to see if we could get a closer view of the arch that follows. No can do. So, we returned under the river and through the sand to the cars. Refreshing hike! 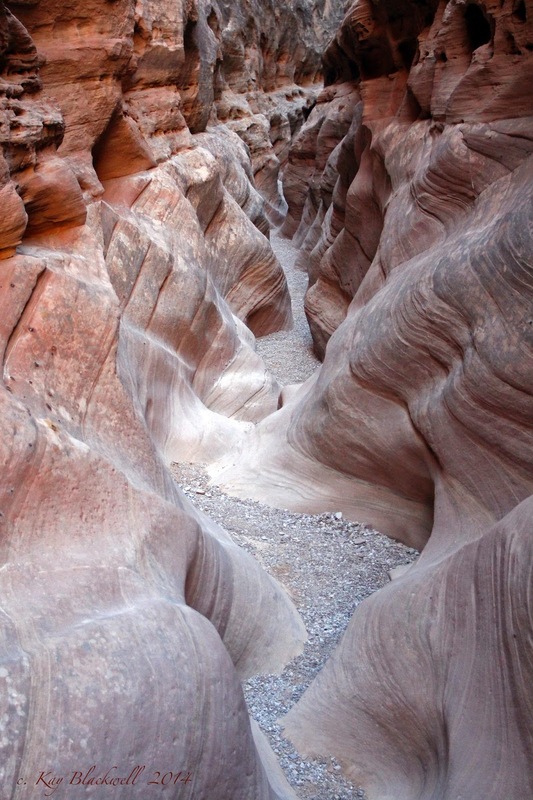 Little Wild Horse Canyon is a Utah treasure. Tucked away in the San Rafael Reef near the Goblin Valley State Park 45 minutes south of Green River, Utah, the trail is a little out of the way! Nevertheless, there were several hikers in the canyon on the Monday that four club members were there. 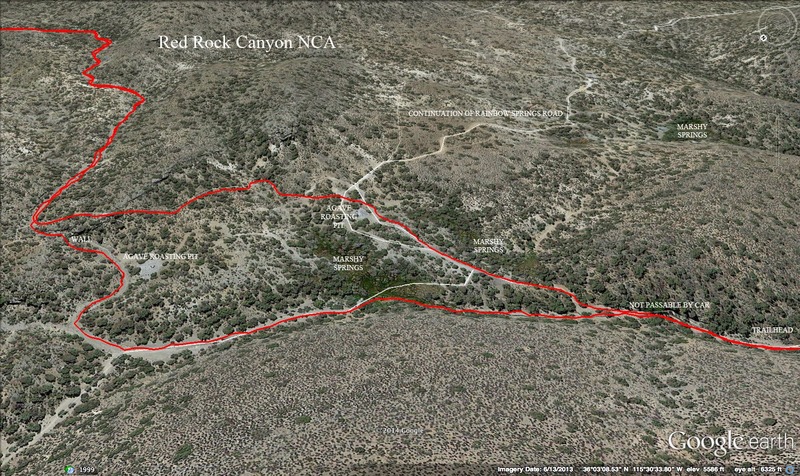 We passed the state park entrance on the paved road and continued out to the signed trailhead parking for the Bell Canyon / Little Wild Horse Canyon Loop. 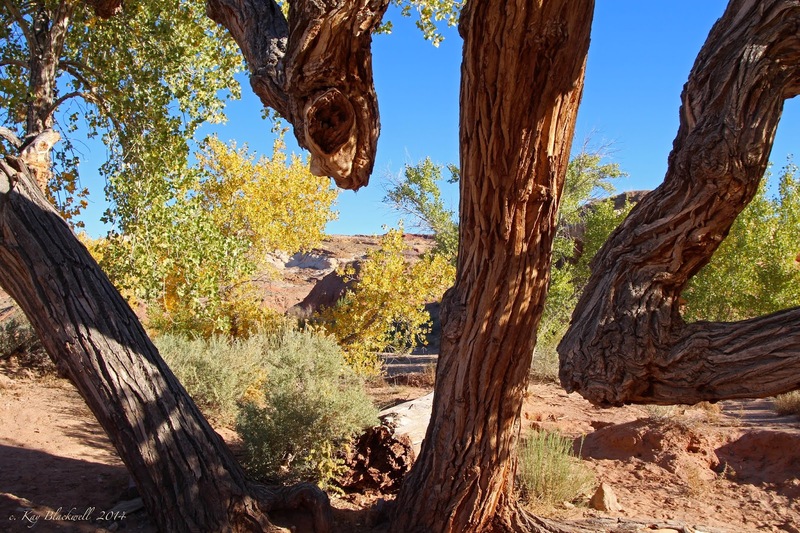 The old cottonwood trees in the canyon wash were beautiful with their fall colors. 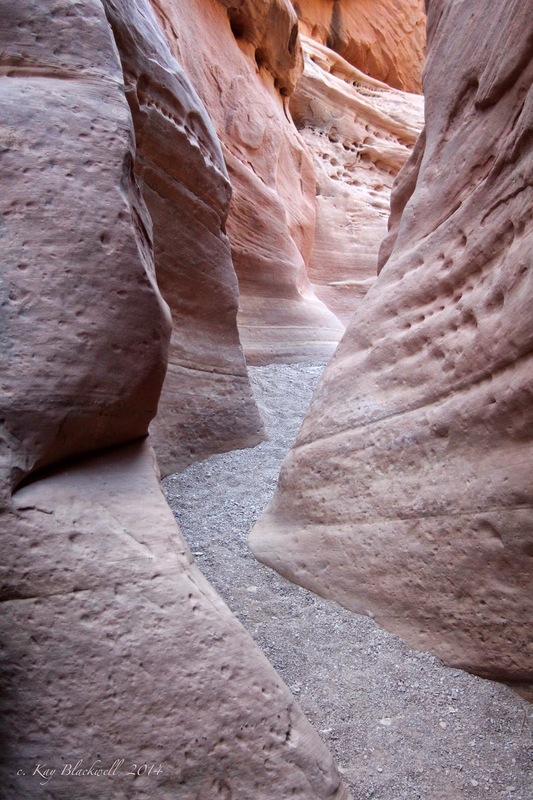 We began the trail by hiking up the wash. The first obstacle came quickly. It was like a test! The 6 foot step up had a precarious up and around on the right side on the wash. After one more 3 foot step up, we came to the signed fork in the canyon. 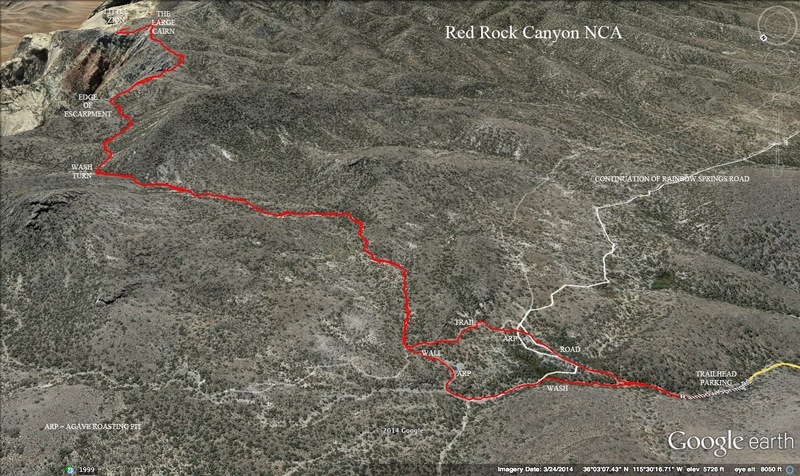 The left fork led to Bell Canyon and the right to Little Wild Horse Canyon. 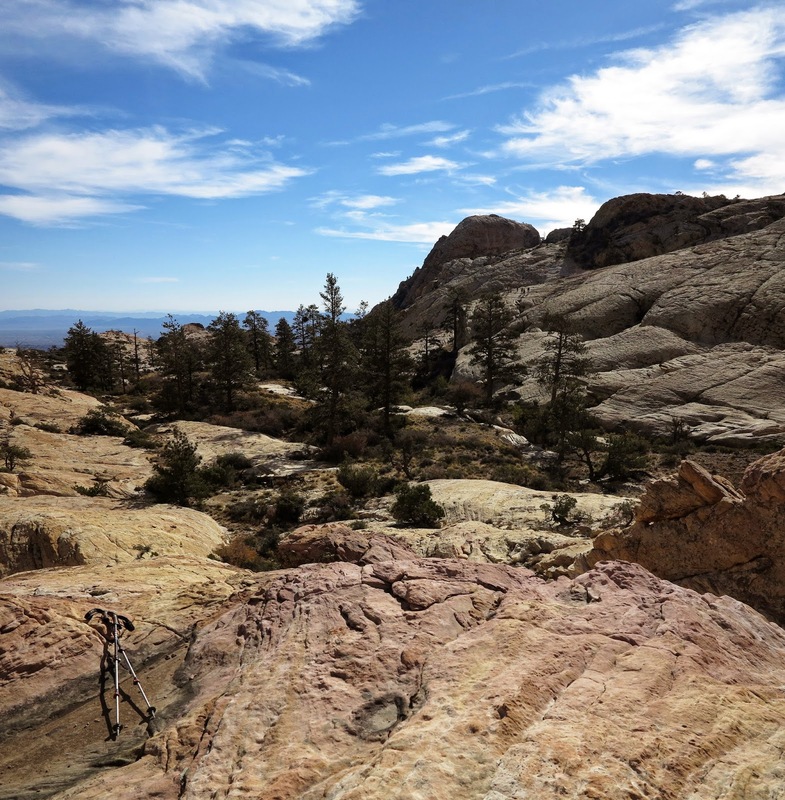 We had decided to forfeit the long loop up Bell and do an out and back in Little Wild Horse. 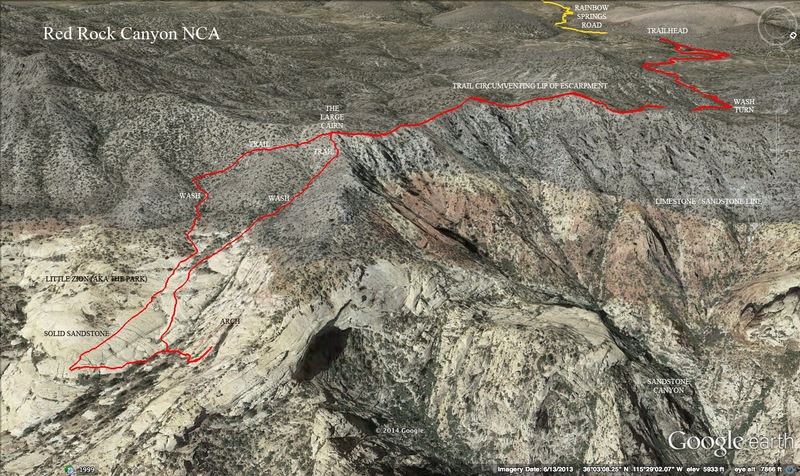 It would still be an eight mile day and, by all accounts, Little Wild Horse Canyon was the more impressive of the two. Little Wild Hores Canyon did not disappoint. We were pleasantly surprised at the seemingly endless slots! 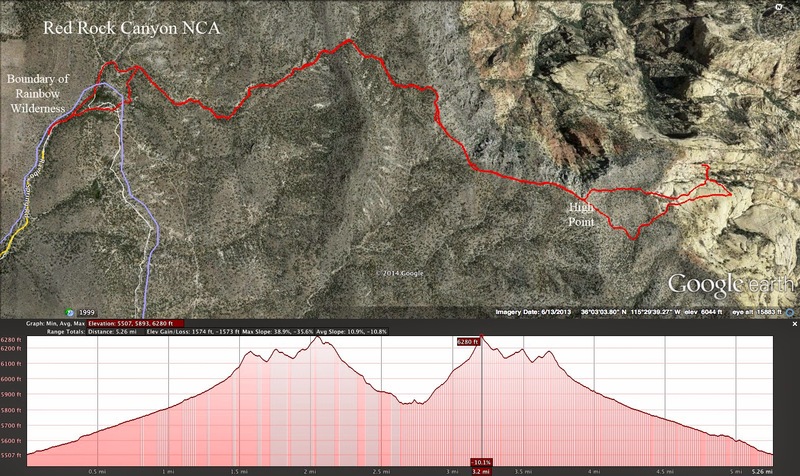 Overall, there were probably three sections of slots over the next two miles. 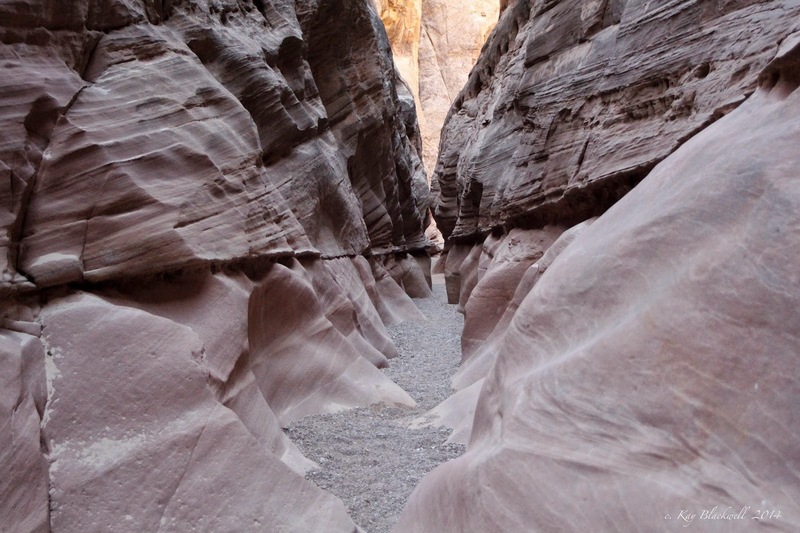 These slots were only separated by two small open spaces in the canyon. 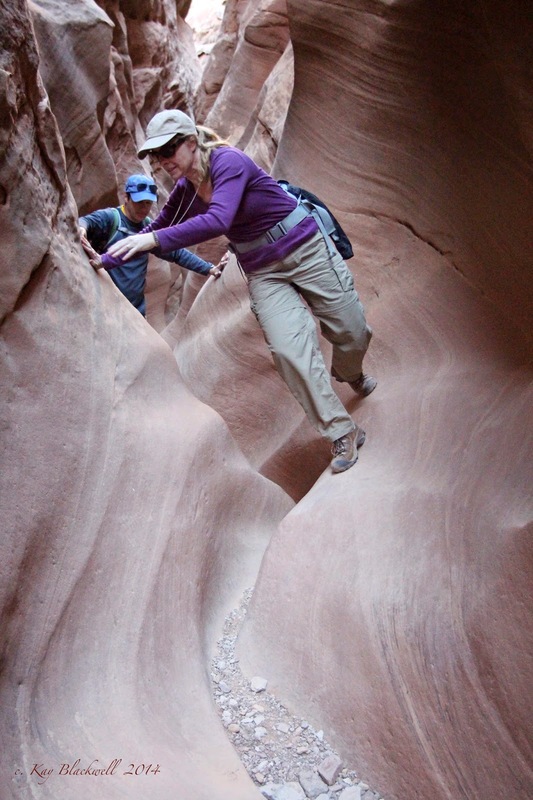 We characterized Little Wild Horse as being Peekaboo, Spooky and Zebra Slots (Escalante NM) all rolled into one! There were not any large obstacles within the slots and it was simply a lot of fun. When we traveled through the first open section, we came to the slot entrance shown in the photo above. Looking around we exclaimed, "Guess this is the trail!" Some places were too narrow to step in. The walls of the slots changed texture from one section to another. Photos were endless! Finally, the slots gave way to a more open setting. 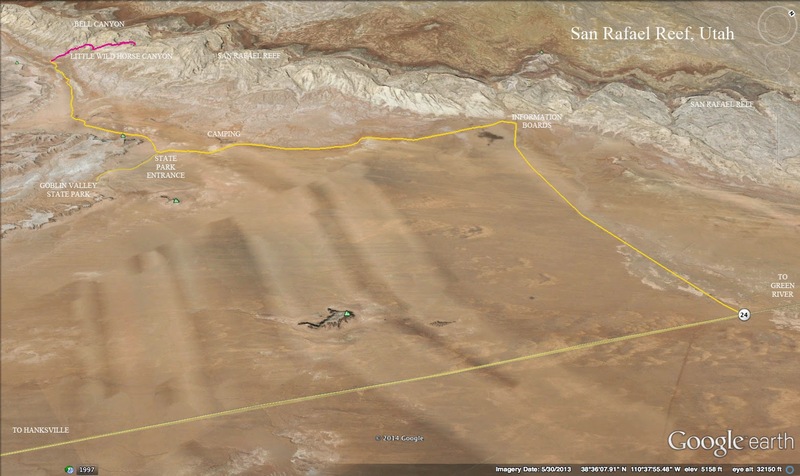 It was here that recent rainwater had created obstacle pools in the wash. Therefore, several "up and arounds" were marked with cairns. Each up and around became more and more precarious as climbs were built up with teetering rock piles. 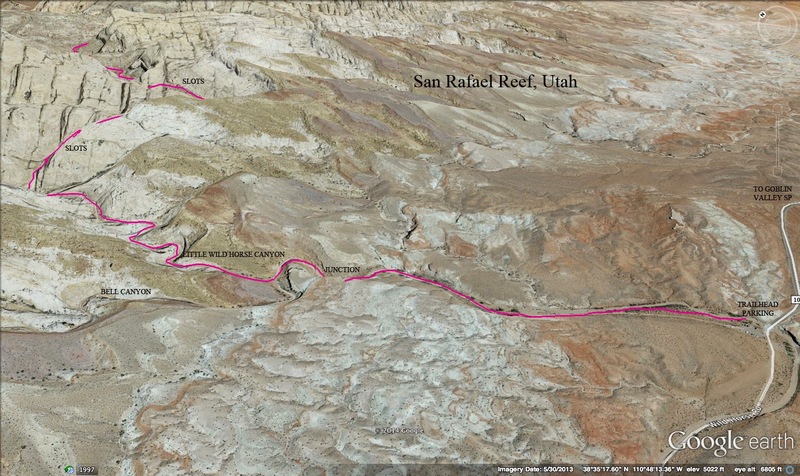 We could see that we were nearing the top of the reef canyon so we decided to call it done! The walls changed texture from section to section. We made sure that the couple in front of us made it up the next up and around so that they could finish their loop in Bell Canyon then we turned around ... satisfied with our exploration. The slots widened toward the top of the canyon. We returned through the slots and took even more photos since the light was a little better then. 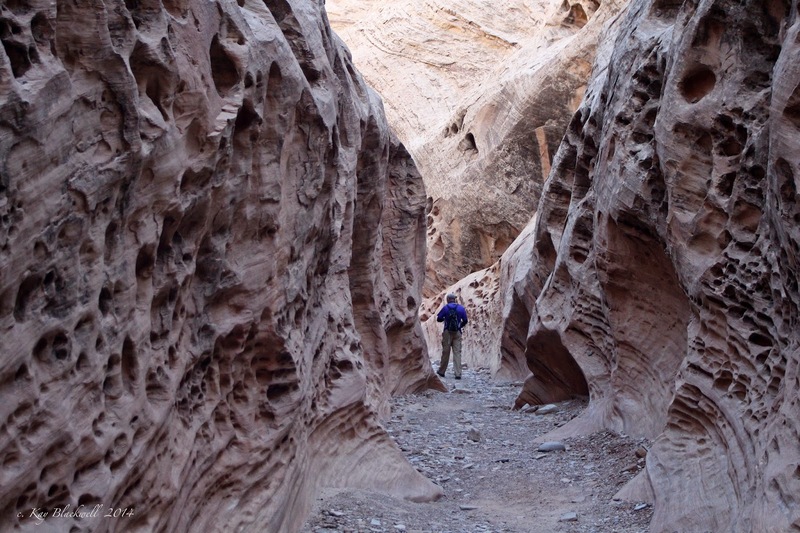 We saw a few things that we didn't see on the way up including the Little Wild Horse in one of the slot canyons' walls. (See first photo.) On our way back through the slots, we tightly squeezed by other hikers.